Explanation: As seen from Frösön island in northern Sweden the Sun did set a day after the summer solstice. From that location below the arctic circle it settled slowly behind the northern horizon. 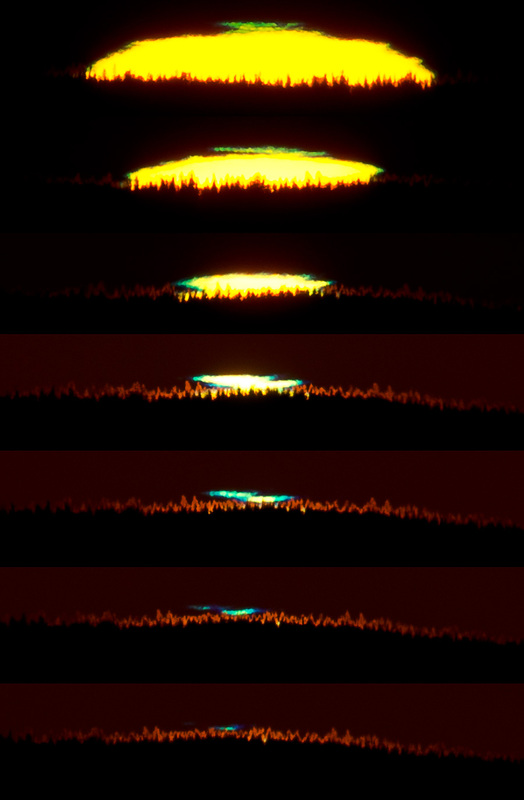 During the sunset's final minute, this remarkable sequence of 7 images follows the distorted edge of the solar disk as it just disappears against a distant tree line, capturing both a green and blue flash. Not a myth even in a land of runes, the colorful but ellusive glints are caused by atmospheric refraction enhanced by long, low, sight lines and strong atmospheric temperature gradients.